To prepare this remedy, we needs the Fenugreek seeds. It is known as methi-dana, which are the seeds of methi. 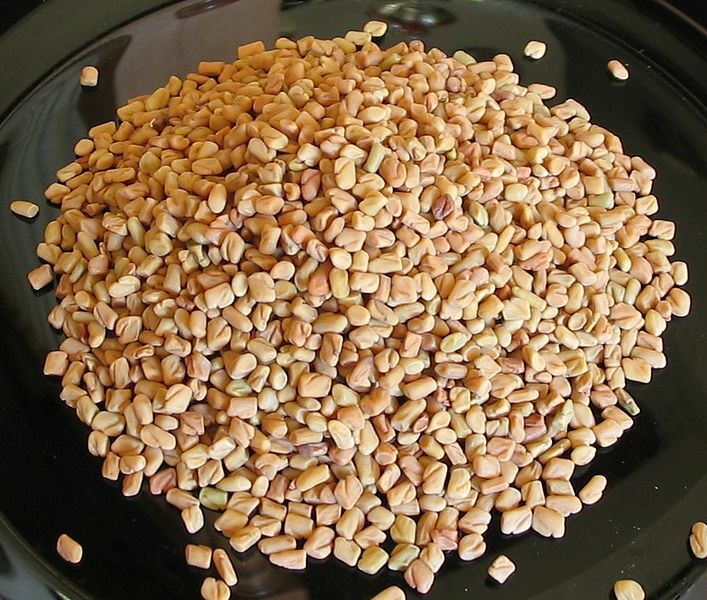 Fenugreek seeds is boon of Ayurveda, it is considered the key to stay healthy. These are beneficial to cure from Diabetes, Sciatica, Blood Pressure, Heart Disorders, Physical Weakness, Anemia, Constipation, Urinary disorders, Gastricism etc. Or Is not an exaggeration to say that, It is able to completely eliminate all diseases. Take the fenugreek seeds in proportion to age of the patient. Eat them daily morning with empty stomach. Eat slowly with chewing every seeds. You can put these seeds into the glass of water at night and in early morning eat them. Or you can prepare a tea to boiled them in next morning, and drink it. Drink after it becomes lukewarm. If you suffer from diabetes. Intake this powder with water every morning, with empty stomach, is the ultimate beneficial. Amount of powder is 1 tablespoon with water. Take 1/2 tablespoon of both fenugreek and soyabean seeds. Make a fine powder by grinding them. Use it twice in a day with water. It would be beneficial for high blood pressure. It is very effective in women's diseases like Leucorrhoea (Leucorrhea), Menstrual irregularity, Highly haemorrhage and Disease of the uterus. You can use any method. All methods are beneficial. Lactation: - It is useful to increase milk supply in lactating women. By using regularly at-least 1 month then definitely you get rid from Pain in knees, Sciatica, Diabetes, Blood pressure, Heart disease and Physical weakness. It is proven very effective in many diseases. And by using 3 to 4 months can be cured all the diseases. You should take it with water or milk. Continuous use at-least 1 month. I hope this would helpful to you. for any suggestion you can leave comment. Fenugreek is very bitter taste know?shall I take that one without chewing?swallowing the seeds with water is beneficial or not? It's beneficial but you can put them in the water at night. Thereafter drink this water in next morning, this is better idea from everything else. I heard that to soak the fenugreek seeds in water overnight and strain the water next day morning and leave the seeds to sprout. And grind these sprouts of fenugreek seeds and add water and take the juice. By drinking this juice diabetes can be controlled. Is it true. If so, what quantity of the seeds is to be taken? Please advice. This is absolutely true, you can use seeds in proportional to your age. For example, if you have 50 years old then use at least 50 seeds for it. I have High BP since last 5-6 years... I am taking a tablet daily. is there any time limit to follow the remedy for High BP (e.g. High BP will be cured permanently in 90 days) or do I have to follow it forever? Other question is - Can I use remedy given under subheading "Remedy For All Disease" rather using specific for High BP? If you will get permanent relief at once then you can stop the use of remedy; it would be a permanent solution. Also fenugreek is totally beneficial in all kinds of consuming method. Sir - I am 30 years old. I was diagnosed with high BP 3 months back. My BP was 130/170 I was on medication for more than a month. My doctor has strictly advised me to continue medication though all my medical reports are normal. I am not taking any medicine since last month. My BP as of today is 82/140. Is it advisable to continue without medicine doctor prescribed and move on to Ayurvedic medicine? Please advise. You can use these given remedies and also visit at - Best Natural Treatments for High Blood Pressure. I have low B.P problem. Kindly suggest Ayurvedic medicine.